If you are looking for the best PayPal review online, then look no further. When considering your merchant services provider, PayPal is also one of the largest and most trusted payment processors in the world. However, with fees and processes geared towards smaller business, branded payment checkout, and a variety of unique features, it certainly is not for everyone. This review of PayPal Merchant Services offers everything you need to see what PayPal offers so you can decide if it’s right for your business. Let’s take at look an in-depth look at PayPal. With more than 200 million active consumer accounts and 17 million merchants, PayPal is one of the largest financial institutions in the world. The company launched in 1998 before being bought out by eBay in 2002, and then branching out into an independent company again in 2015. Today, PayPal owns small business and payment processing solutions like BrainTree, Paydiant, Venmo, PayPal Credit, Xoom Corporation, and card.io. PayPal offers a wide variety of services and a transparent fee structure that makes sense… if you can find it. 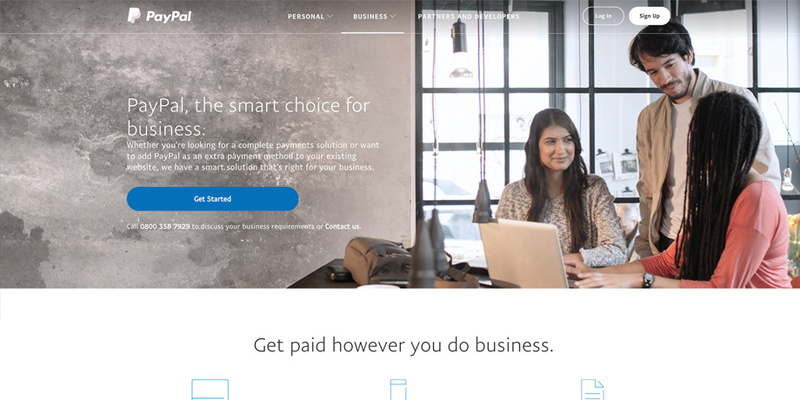 Unfortunately for most small business owners, actually finding information on PayPal’s website means navigating their often maze of a website, which can leave you feeling confused. However, the fee structure is fairly straightforward, with most payment options including a volume-based fee + a flat rate fee, available with interchange + or blended. PayPal offers a number of PDQ solutions through PayPal here, as well as the ability to set up and accept both PayPal and card transactions in person. PayPal Here card readers range from £35-£79.95, and include mobile and app support and PCI compliance. However, transaction fees are based on payment type and on transaction volume. PayPal Merchant Services includes multiple additional services including virtual terminals, online invoicing, and international sales with currency conversion. You can also accept funds in other currencies, from nearly anywhere in the world, with the same transaction rates as users in your country. However, you will pay an additional 4.5-2.5% conversion fee for transactions in other currencies and a +1% additional charge for international cards. PayPal divides its merchant services into multiple solutions, with one premium option, and several free offerings. Each of these has pros and cons, and all are branded with PayPal logos at checkout. The two primary solutions include a Standard Merchant Account and a Pro Merchant Account. Both options work with all other PayPal Merchant services. PayPal’s standard Merchant Account is free, but offers fewer solutions, less customization, and fewer payment offerings. The largest difference is that users who do not have a PayPal account will primarily only be able to pay with debit card. However, the standard account comes with a full range of features including online invoicing, debit cards, PayPal payments, phone support (you may be billed), customisable buttons and checkout pages, and integration into a wide range of services. You can also integrate fully into most major e-commerce solutions like Magento, Shopify, WooCommerce, PrestaShop, and many more. PayPal’s Pro Merchant Account services includes all of the Standard features plus additional offerings. Pro also includes a virtual terminal solution, integrated checkout page (customers aren’t directed off site to finish their purchase), and includes free phone support. A Pro account also enables you to accept most major debit and credit cards from customers who do not have a PayPal account. Express Checkout is a free solution for business owners who want to accept online payments with PayPal, but who already have a merchant account. Here, you simply add a PayPal payment option to your existing checkout page and credit and debit cards are processed through your existing account. PayPal offers services that are primarily geared towards small businesses, with offerings including e-commerce and web sales, virtual terminals, payment gateways, in person payments, and invoices. This enables you to accept a variety of payment types and options, with one subscription and solution. PayPal is primarily designed for online and e-commerce sales. With Express Checkout, PayPal Standard, and PayPal Pro, you can easily integrate online checkout pages, integrate with custom checkout pages into almost all major and minor e-commerce platforms, and integrate custom checkout buttons anywhere using HTML. Online costs are typically charged on a volume-based rate. PayPal’s virtual terminal enables you to accept payments over the phone, via email, fax, or snail mail. This is ideal if you advertise products and accept orders over the phone, have a catalogue or magazine, or sell directly from a newsletter or brochure. Virtual terminals start at £20 per month and include an additional card-not-present fee. You can choose to pay a blended fee of 3.4% + 20p per transaction (customized to the retailer), or an interchange + 20p rate, which will fluctuate based on the card but average at 0.2-2.5%. PayPal offers several brick and mortar sales solutions including an app and a PDQ point of sale solution with PayPal Here. You can also choose technology from one of PayPal’s partners, who offer a larger range of point of sale and PDQ terminals. You should expect to pay volume-based fees with either a blended rate of Interchange +. PayPal offers a mobile card reader for phones, a mobile payment app, and invoicing, which enable you to accept payments from anywhere. PayPal offers merchant account services like payment gateways, card processing, checkout pages, and virtual terminals, but the service is intrinsically different than most other solutions. This is important if you are considering going with the service, already have a setup for a traditional merchant service, or are considering switching to PayPal. For example, PayPal does not transfer funds immediately to your bank account. Most merchant accounts batch process funds 1-2 times per day, and transfer funds to your account, or process within 2-14 days. You are charged a small processing fee of about 10p each time, and funds are deposited into your account. Any PayPal transaction, including credit and debit card transactions, are deposited into your PayPal account. You will have to manually transfer it to your account before you can spend it or pay bills. However, you can also set up a PayPal debit card and PayPal bill pay to use funds on your account without transferring them to your account. PayPal Here is PayPal’s brick and mortar or in-person payment service. It includes an app and several PDQ terminals, as well as accessories such as Point of Sale tablets, receipt printers, and cash drawers. The PayPal Here app enables you to connect your PayPal card reader to PayPal. If you purchase a PayPal POS or card reader, you need the app. It is free and available for iPhone, iPad, and Android. The Chip and Swipe Reader enables you to accept Chip and Pin cards as well as Magstripe cards. The terminal is mobile and operates via Bluetooth, making it ideal for use in restaurants and other service-industry businesses. However, with no keys, this is not an ideal solution if you regularly process payments larger than £25. The Chip and Tap reader offers all of the features of the Chip and Swipe, with the addition of contactless payment. This allows you to accept Apple and Samsung Pay, as well as other mobile phone and smartwatch-based payment solutions. The Chip and Tap Reader does not include keys for inserting pin codes. The Mobile Card reader is a very small card swiping device which you can attach to a smartphone with the PayPal Here app. This allows you to quickly accept payments from anywhere, so long as your phone has access to 4G. PayPal Merchant Services has a lot to offer, and is offered by a large international company, however, there are many complaints about the service. Customer Service – PayPal typically hosts customer service in other countries, which reduces costs for them and you, but can downgrade the quality of service. Most customer service agents also respond using a script, which means that it can take several emails for someone to figure out your problem. Calls are typically handled more quickly, but you may have to wait on the phone for a considerable amount of time, and, like the website, have to navigate your way through multiple operators and menus to get the service you need. Freezing Funds – In some cases, PayPal may choose to freeze the funds in your account to perform a security verification. For this reason, it is very important to completely setup and verify the account including address, identification, bank account, and a card before accepting payments. Conversion Rates – PayPal charges an average of 4.5-2.5% in conversion rates when processing funds internationally. You may also have to pay an additional 1% surcharge on foreign debit and credit cards. Chargebacks – PayPal’s chargeback fee of £14 is high compared to some competitors. If customers frequently request refunds, you will be better off choosing another service. High Transaction Fees – PayPal charges high transaction fees in comparison with traditional merchant account services. For example, the average industry rate is about 2.5% and PayPal charges 3.4-2.9% for most accounts. However, PayPal offsets these costs in other ways, such as by reducing the need for PCI compliance, delivering an all-in-one solution, and offering multiple services like PDQ, credit card, and virtual terminal under a single subscription. PayPal is completely PCI compliant. More importantly for small business, standard PayPal transactions are redirected to PayPal’s website, meaning that they handle all security and information for the transaction. This reduces costs and means that you will not have to ensure your site is PCI compliant unless accepting cards using another merchant account provider. PayPal is one of a number of merchant service solutions geared towards small and micro businesses. Comparing your options, what they offer, and their fees can help you to decide if PayPal is the best choice for your needs. Each of these services also has its own niche. For example, Stripe and Braintree are online only, while iZettle covers face-to-face sales only. PayPal offers numerous benefits to small and micro businesses and almost none to larger organizations. While not every small business will benefit from PayPal, most do, and it’s an excellent place for most to start. Setup Time – PayPal is extremely easy to setup. The company allows you to quickly and easily select features, and then creates custom HTML, which you can paste into your own website. You can also integrate a PayPal partner for near-instant integration. Available (Nearly) Everywhere – PayPal accepts 130 currencies and nearly every major debit and credit card. That makes it easier to sell to international audiences, or to make it simple for customers to purchase at home. PayPal’s widespread availability also means trust, with one report by Nielsen showing that customers are 40% more likely to checkout on an unknown website if it offers PayPal. Immediate Transaction Processing – Most PayPal payments arrive nearly instantly, with some (Interchange +) taking 1- 2 days to process. All-In-One Services – PayPal offers nearly all of their services under two very simple subscription options, free or £20 per month. That’s a lot easier than most other solutions, and you get a lot with both offerings. No Hidden Fees – PayPal does not have startup or termination fees, contracts, or any other form of hidden fees. Integration – PayPal integrates into most e-commerce and website CMS solutions with the click of a button. Developer Tools – PayPal has a lot to offer for developers who want to integrate PayPal into a custom site, app, or even a game. PayPal Merchant Services have a lot to offer, especially for new businesses. Online sellers or small brick and mortar businesses who also sell online will get the most out of PayPal, primarily because it is highly secure, very easy to setup, and very widely accepted. Brick and mortar only sellers are much better off with solutions like Braintree (a PayPal service) and iZettle, both of which offer much cheaper transaction costs. Larger businesses will also benefit much more from a traditional merchant account, which offers unbranded checkout pages, direct deposit to bank, and significantly cheaper transaction rates. Overall, PayPal is a great solution, and ideal for anyone just starting out who needs to set up and start accepting payments quickly.